Kevin Harvick started 14th and finished seventh to earn four bonus points. The Busch Beer driver stayed out during the first two cautions of the race prior to the competition caution. Harvick came to pit road under the competition caution on lap 35 for four tires, fuel and an air pressure adjustment. The No. 4 Busch Beer Ford raced into the top-10 on lap 56. Harvick brought the car to pit road for four tires, fuel and an air pressure adjustment at the conclusion of the stage. Started sixth and finished fourth to earn seven bonus points. Harvick raced into the top-five on lap 85 and up to fourth by lap 103. The No. 4 Ford struggled with a tight-handling condition late in the stage. The Busch Beer Ford came to pit road for four tires, fuel and air pressure and wedge adjustments at the conclusion of the stage. Started fourth and finished first to earn five playoff points. Harvick struggled with a loose-handling condition at the beginning of the stage and fell to the sixth position. He raced back into the top-five on lap 188 and up to third by lap 202 as the handling improved on the longer run. The Busch Beer Ford came to pit road under green on lap 125 for four tires, fuel and an air pressure adjustment. Harvick raced to the lead on lap 228 following the green-flag pit stop. The No. 4 Ford dropped back to the second position on lap 232 when he was passed by teammate Aric Almirola. Harvick came to pit road under caution from the second position for four tires, fuel and an air pressure adjustment on lap 258. The Busch Beer Ford restarted second on lap 262 and patiently stalked the race leader. Harvick battled with the No. 18 car as the laps wound down, taking the lead for the final time with only seven laps to go and cruising to the victory. This was Harvick’s 43rdcareer NASCAR Cup Series win, and it keeps him in sole possession of 18thon the all-time NASCAR Cup Series win list. One more win will tie Harvick with NASCAR Hall of Famer Bill Elliott for 17th. This was Harvick’s 20thMonster Energy NASCAR Cup Series victory since joining SHR in 2014. This was his series-leading sixth victory in the 2018 Monster Energy NASCAR Cup Series. 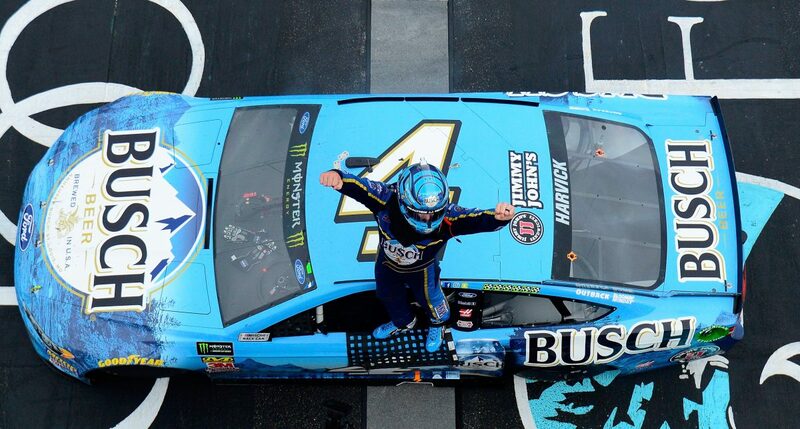 This was Harvick’s third victory in 35 career Monster Energy NASCAR Cup Series starts at New Hampshire. Harvick finished seventh in Stage 1 to earn four bonus points and fourth in Stage 2 to earn an additional seven bonus points. Harvick led three times for 12 laps to increase his laps-led total at New Hampshire to 718. Harvick’s margin of victory over second-place Kyle Busch was 1.877 seconds. “Winning is important, and you’ve got to try to take every opportunity you can. I felt like my car was better. He (Kyle Busch) was in the lane that I needed to be, and as you get to the end, as you saw at Chicago, you’ve got to be aggressive and do what you’ve got to do sometimes to win these races. It’s one of those deals, and we want to win. Points are everything, and getting a ‘W’ is what it’s all about.